Pushkar : One of the five sacred dhams (pilgrimage site) for Hindus. Of all places in Rajasthan, if there was one which we thought was all hype and no substance, then it was surely Pushkar. Images of its claustrophobic annual melas and backpacker-crowded lanes made us believe that it was nothing but a tourist gimmick to attract as many travelers as possible at the cost of its religious importance. But just like most other places in the state, this quaint little temple-town surprised us with its genuine charm and laid-back attitude that warmly welcomes both the devout as well as the curious traveler to stop by and join in; an absolute gem in the heart of the state! From Nagaur, we boarded a crowded State bus to Pushkar and after an uneventful journey got to our destination early in the evening. We had reservations at Bharat hotel where we checked in promptly and then set out to explore the village on foot. Situated on the banks of Pushkar Lake, this tiny village-town is known for its temples and religious significance, as according to Hindu mythology the lake was created by Lord Brahma himself! It is said that Lord Brahma performed years of penance at this sacred site for a glimpse of Lord Vishnu. And due to this legend, Pushkar is one of the few places in India to have a Brahma temple. This temple and a host of others are said to be at least a thousand years old but most of them were completely rebuilt after the original structures were destroyed by invading Muslim rulers. Today these temples and the 52 ghats (stone steps leading to the water from the bank) surrounding the lake, attract thousands of pilgrims and spiritual seekers from around the world. 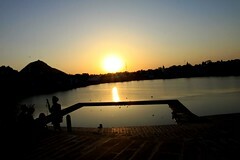 We headed straight for Pushkar Lake and got there just in time for sunset. And I think it was precisely at this moment that Pushkar enchanted us completely! The ghat was not too crowded but filled with visitors sitting on the stone steps and gazing out on to a placidly serene water body that looked surprisingly clean. A musician with a Tabla (Indian percussion instrument) sat on a cemented platform atop the steps and played some wonderful rhythms, which had pretty much everybody swaying or tapping their feet. We sat along with the others and watched the glorious sunset in this awesome atmosphere and enjoyed every minute of it. We immediately realized why Pushkar is so popular amongst travelers – it has a spiritual yet relaxed vibe that is apparent the minute one wanders near the lake front! Every evening of our stay at Pushkar was spent at its ghats enjoying the sunset, the clanging of temple bells in the background as evening prayers are offered, the music played on Rawanhathas (stringed folk instrument) by locals and the stray dogs that walked about looking for some food and affection; all quite magical! 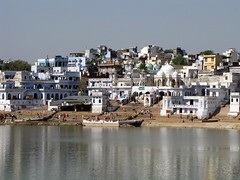 Pushkar’s main attraction is the lake and the temples and ghats that surround it. So the following morning, after an early breakfast we circumambulated the lake stopping at all the ghats and visiting the temples along its shores. It was a fun walk and gave us different glimpses of the town that has sprung up beyond the lake. Surprisingly, in spite of a reasonable number of pilgrims and tourists, the lakeside was calm and serene and truly spiritual. I can imagine how wonderful the devout must feel here! We visited the Brahma Temple, the Varaha Temple (dedicated to Lord Vishnu), Savitri and Gayatri temples (dedicated to Lord Brahma’s consorts) and a few smaller, lesser-known temples, all within a couple of hours of walking and exploring the village. Of course, Pushkar’s other big attraction is its annual Camel fair, which is considered to be Asia’s largest! Unfortunately, we couldn’t time our visit to coincide with it as it usually falls during the months of October or November. It’s said that the fair attracts over 200,000 people and 50,000 camels. I cannot even imagine what that must feel like! And needless to say, the strain on the village’s infrastructure must be tremendous at such times! The year-round presence of travelers in this village has ensured the sprouting of numerous hotels, restaurants, cafes and stores. We loved browsing through all the knickknacks sold here, even though they were pretty much the same stuff we saw elsewhere in Rajasthan. I couldn’t resist buying some cushion covers for us and for family as they were priced well and looked terribly attractive. As for food, there were plenty of options available but of course, being a sacred town it was all vegetarian. We didn’t complain, though, ‘coz, apart from yummy local food, we also found some really nice restaurants where Italian or Mediterranean-style food was being offered in wonderfully relaxed ambiences. Looking back, I don’t exactly remember what we did during our 3-day stay in Pushkar. There is nothing specific to see or do out there except walk around, browse through the many street-side stalls, watch the sunset at the ghats, visit the temples, listen to beautifully played-out Hindi film music on Rawanhathas, eat good food and generally chill; the best recipe for some fabulously lazy days!